Hilton Head Island’s history teems with tales of nautical natives, intrepid seafaring explorers, and salty fishermen, shrimpers and oyster farmers. The depth of our tidal creeks, rivers and waterways is measured not in feet but by these rich stories. 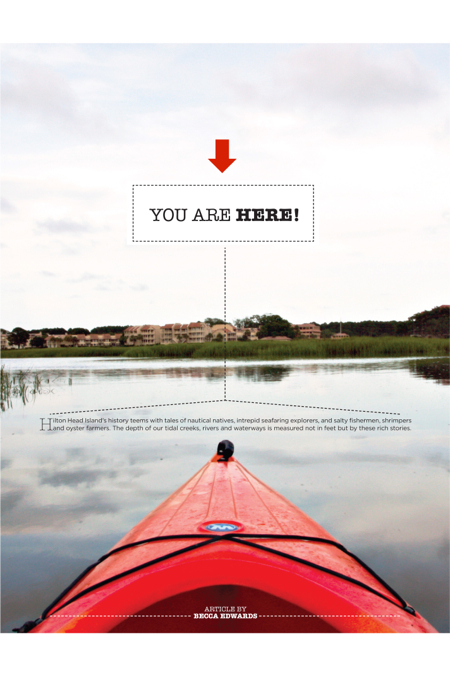 Thanks to Overton and companies like H2O Sports, Kayak Hilton Head and SUP Adventures (just to name a few), there is no shortage of water-based activities. “We offer kayaking, stand up paddle boarding, motor boating, fishing, water skiing, knee boarding, wake boarding, tubing, private charters, group excursions, and retreats to remote islands,” Overton said. “Our signature trip is our Ultimate Lowcountry Day. Many of our guides grew up in the area, and we have compiled a menu of options to help people plan their perfect day on the water.” You can also dip your toes in water recreation by going on a dolphin watch cruise, parasailing, windsurfing, sailing, jet skiing, or cocktailing on a catamaran like Pau Hana. “There really is no limit to the things people can enjoy on the water,” Overton said. Likewise, popular destinations with rich histories and anything from fine to funky restaurants and scenic views are just a jaunt away. “Daufuskie is easy,” Norman said. “The kids can run around, and the parents can relax. We have a favorite picnic spot that is really beautiful and never crowded.” Norman also enjoys “making a run” up to Palmetto Bluff and letting his two boys play in the Inn at Palmetto Bluff’s treehouse, or embarking on a day trip to Savannah, Tybee or Beaufort. Hilton Head also provides several unique opportunities to see the sea and creeks from interesting perspectives. From the Shelter Cove fireworks every Tuesday night, to full moon kayak tours, to dock jumping, our waters flow with the possibility to create unforgetable good times. “I have found that if you ask someone about their favorite memories, it often relates to the outdoors and the water,” Overton said. Must Do: Marshside Mamas’ steamed shrimp and deviled crab. Must Do: The Summer Concert Series and s’mores outside the Inn at Palmetto Bluff. Must Do: A walk along the riverfront and drinks at the Bohemian. Must Do: Visit the Tybee lighthouse and museum. Must Do: Beaufort Water Festival (July 17-26).